This project turned out to be one of my favorite improvements we've done to the house. Not only did it cover up the dated textured ceiling but it also provided a great conversation piece and enhanced the rustic look we are trying to achieve. While this project isn't difficult skill-wise, it was labor intensive and took us one weekend to complete. Thanks to my super awesome husband, Richard, for doing all of the labor while I critiqued...er...I mean watched...silently and with admiration. Pardon the mess but we actually lived through this remodel. We considered hiring someone to patch up the drywall and remove the texture from the ceiling, but after getting a few bids I decided to explore some other options. I found a planking tutorial on Pinterest and knew this was totally something we could do ourselves. The next, most difficult task would be to convince the husband to assist me with this... Much to my surprise he said, "YES!" and off we went to Lowe's to grab our supplies. 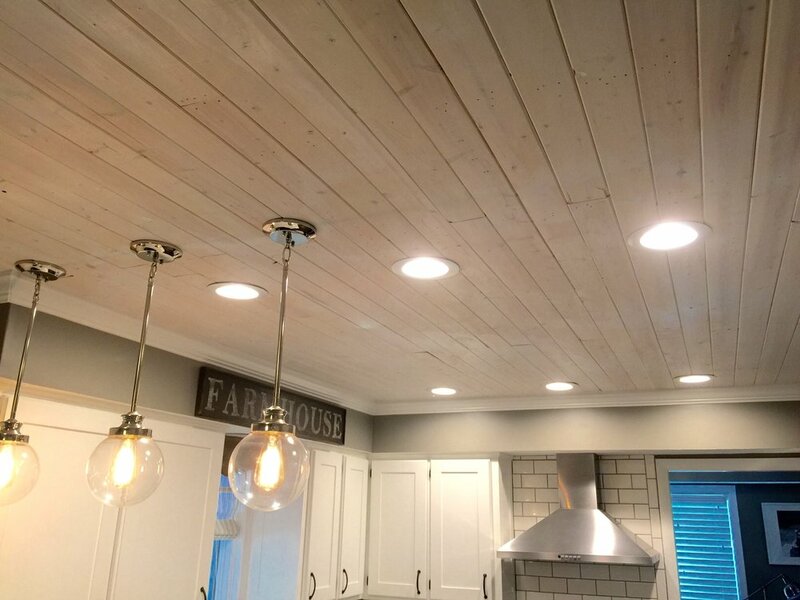 I really wanted the ceiling to have a rustic feel so we purchased these "knotty pine" planks to get that natural wood look. These were in stock at Lowe's and the price was right! These planks are extremely easy to install. They are very lightweight and have a tongue and groove edge that allow them to fit together neatly. The first thing we needed to do for this install was locate the ceiling joists that we would be nailing these planks into. Then we came up with a pattern for the planks so the seams would be similar to what you would find on a wood floor. We started off with a whole plank in the first row, then we started the second row with three-fourths of a plank, the third row started with half a plank and in the fourth row we repeated the pattern starting again with a whole plank. Staggering helps to hide imperfections in the board and keeps your eyes moving. We attached them with liquid nails and a nail gun. Having a nail gun has been life changing! We've used it for so many different projects and have saved ourselves from hours of work because it is so fast and easy to use. If you don't want to buy one, I would highly suggest renting one for this project from your local home improvement store. It's worth every penny! Once we got the hang of it, it was pretty smooth sailing. Sometimes you'll run into an obstacle you need to cut around. We were simultaneously installing recessed can lights into the ceiling so we used a jig saw to make these curved cuts. The best way to make precision cuts is to make a template out of cardboard and then trace it on to your plank. Here's the finished ceiling before paint. Originally, I had planned to paint the planks white but after seeing all of the perfect imperfections in the wood I just couldn't bare to cover it up. We decided to white-wash it so we could still get the clean white look we were going for while allowing the rustic nature of the wood to peek through. White-washing is super simple. Basically, you take 1 part paint and mix it with equal parts water and then just paint it on and wipe off the excess with a rag. You can easily adjust your white-wash formula to suit your taste. Final product! Love how it turned out! We added crown molding to cover up the seam between the planks and the wall. The same company that makes the famous Kreg Jig also has a super handy tool to help with cutting crown molding. It's called the Kreg Crown Molding Tool and it made it easy peasy! Couldn't be happier with the end result, it turned out even better than I imagined! We get so many compliments about our planked ceiling and people can't believe we did it ourselves.